The DTSPU65 series of AC DC desktop power supplies offers up to 80 watts of continuous output power. This series consists of models ranging from single to quad outputs with input voltage range of 90~264VAC and various output voltages. 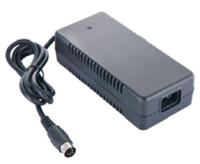 Models are equipped with an input inlet of IEC-320-C14 and multiple output cables are available. All models are protected against short circuit, over voltage and over current conditions, and have UL 60950-1:2nd Edition, IEC 60950-1:2005/A2:2013, EN60950-1:2006/A2:2013 safety approvals. All models are RoHS compliant and are Efficiency Level VI compliant (excluding DTSPU65-101 and DTSPU65-403 models). Please call factory for ordering details. 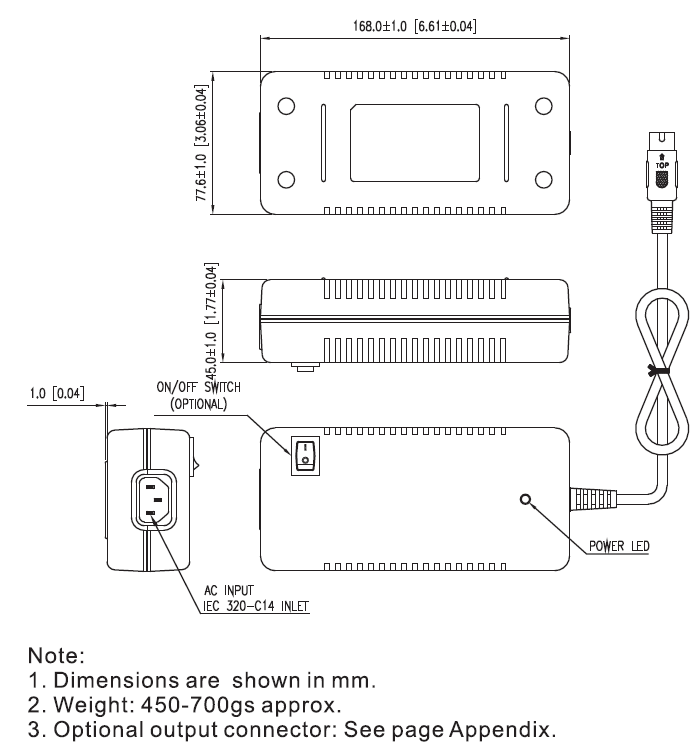 Dimensions: 6.61" x 3.06" x 1.77"
DTSPU65-101~106 are required to use AWG#16X5C/4FT output cable. DTSPU65-107 is required to use AWG#16X2C/4FT output cable. DTSPU65-108~109 are required to use AWG#18X2C/6FT output cable. DTSPU65-110~111 are required to use AWG#20X2C/6FT output cable. DTSPU65-2XX, 3XX are required to use AWG#16X5C/4FT+core output cable. DTSPU65-200, 204, 300, 306 are required to use AWG#16X5C/2FT+core output cable. Electrical characteristics will be changed by modified output cable. (2)	The DTSPU65-105(12V), DTSPU65-107(16V), and DTSPU-201 are available on KC mark (Korea Certification). The DTSPU65-109 is available on NRCan mark. (3)	Output can provide up to peak load when power supply starts up. Staying in rated load continuously is not allowed. (4)	Line regulation is defined by changing ±10% of input voltage from nominal line at rated load. (5)	Load regulation is defined by changing ±40% of measured output load from 60% rated load. (6)	Ripple & Noise is measured by using 20MHz bandwidth limited oscilloscope and terminated each output with a 0.47uF capacitor at rated load and nominal line. (7)	Hold up time is measured from end of the last charging pulse to the time which the main output drops down to low limit of main output at rated load and nominal line. (8)	Efficiency is measured at rated load and nominal line.